The Sun sustains life on the Earth. Sun Salutation is the appreciation for the Sun in the form postures with Mantras chanting. Surya Namaskar is the best practice to maintain health. 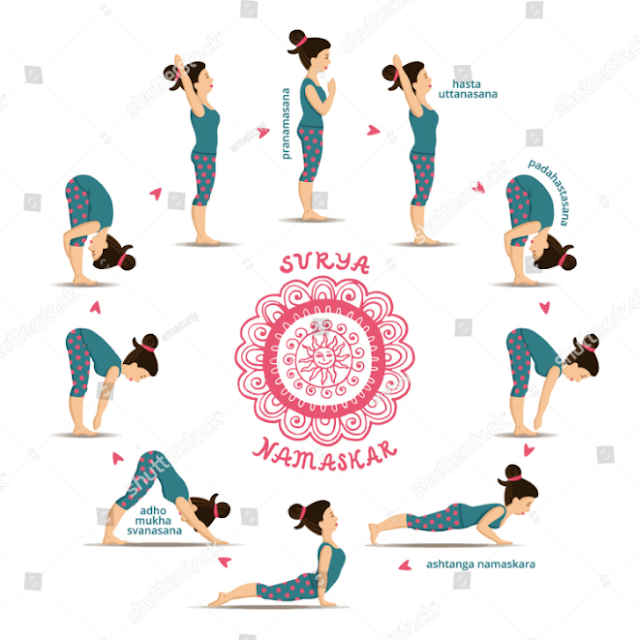 Surya Namaskar includes Pranayama, Mantra, Asanas, and Meditation. It creates harmony in breath, body, and mind. Asanas help to maintain physical strength and Mantras chanted with asanas with gratitude enhance spiritual level. Increase energy at both the physical and mental level. It opens the gates of mind and body to receive positive energy. It feels body and mind with the energy of the Sun. It keeps the digestive system perfect. It makes spine and waist flexible by removing disorders. It improves blood circulation in the body which removes skin diseases. Meaning: One who is friendly to all. Meaning: The shining or the radiant one. Meaning: The dispeller of darkness, responsible for generating activity. Meaning: One who illuminates or the bright one. Meaning: One who is all-pervading, one who moves through the sky. Meaning: Giver of nourishment and fulfillment. Meaning: One who has a golden colored brilliance. Meaning: Giver of light with infinite rays. Meaning: The son of Aditi, the cosmic divine mother. Meaning: One who is responsible for life. Meaning: One who is worthy of praise and glory. Meaning: Giver of wisdom and cosmic illumination.